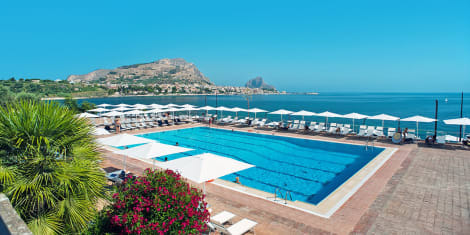 The modern 4-star Hotel Domina Zagarella - Sicily is found overlooking the spectacular Porticello Gulf Coast, and is just a few kilometres from the heart of Palermo. Take in sea views from the terrace, take a dip in the open-air pool, try your hand at a new sport, and treat yourself to local and international flavours in the 4 on-site bars and restaurants. Hotel Domina Zagarella - Sicily's rooms are inspired by 50s and 60s style, and include free wi-fi access and private bathrooms. A stay at La Caletta places you in the heart of Santa Flavia, a 4-minute drive from Mount Catalfano Park and 9 minutes from Villa Santa Teresa. This bed & breakfast is 10.9 mi (17.6 km) from Foro Italico and 13.9 mi (22.3 km) from Palermo Harbour. Make yourself at home in one of the 6 air-conditioned rooms featuring minibars. Complimentary wireless Internet access keeps you connected, and satellite programming is available for your entertainment. Private bathrooms with showers feature complimentary toiletries and hair dryers. Conveniences include desks, housekeeping is provided on a limited basis, and cribs/infant beds (complimentary) can be requested. Make yourself at home in one of the 18 air-conditioned rooms featuring minibars. Complimentary wireless Internet access is available to keep you connected. Bathrooms have showers and complimentary toiletries. Conveniences include safes, and both cribs/infant beds (complimentary) and rollaway/extra beds (surcharge) are available on request. lastminute.com has a fantastic range of hotels in Santa Flavia, with everything from cheap hotels to luxurious five star accommodation available. We like to live up to our last minute name so remember you can book any one of our excellent Santa Flavia hotels up until midnight and stay the same night.